Normally, I adore Gena Showalter books, but I have to say that I didn't love this one. The good: Like her other books, this one is extremely readable. Great characters and realistic dialog make it easy to keep reading page after page. The story is intriguing - a boy who has four other souls living inside him. He's lived with this group his whole life, and has some interesting "powers" - time travel, raising the dead, seeing the future. The bad: Too many pieces to the story. This is a big book - almost 500 pages. And just Aden's history could fill it. Instead, we are introduced to Aden and his history, Mary Ann and hers, Riley and Victoria. Vampires, werewolves, fairies, witches... Time travelers, zombies. And this is obviously just the first book in a series - it is left with far more hanging than was resolved. And while I'm curious to see how things progress, I'm not sure I'm willing to invest the time and energy into it. 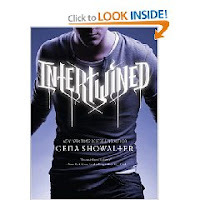 Probably, though, I will - I love Gena Showalter and will most likely get my hands on the next one as soon as it's out - which is September 2010 and it is titled Unraveled.